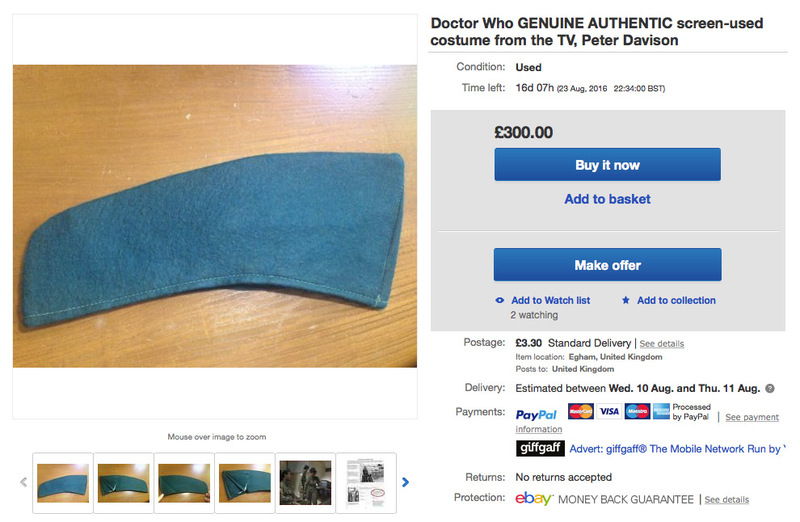 This first item I found on eBay this month was originally sold at the big Bonhams Doctor Who costume auction in 1991. 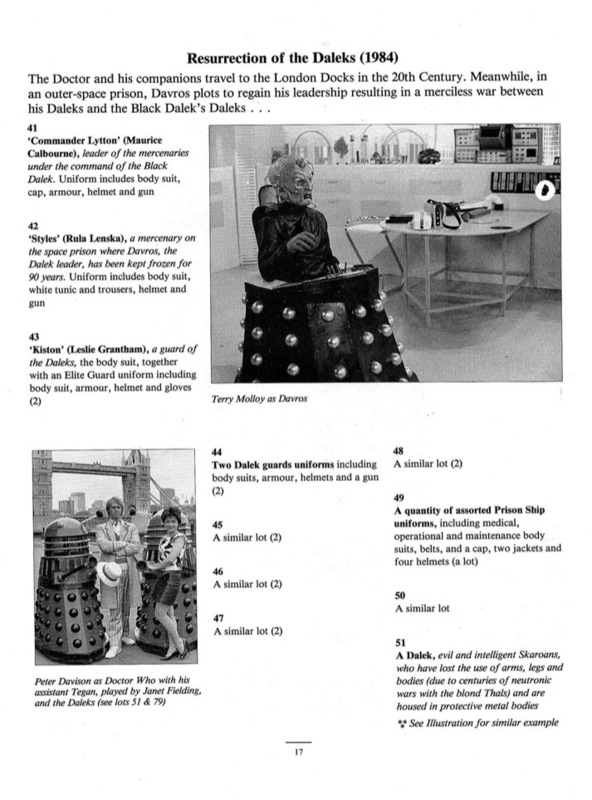 It was either part of Lot 49 or Lot 50, which contained a number of costume pieces from Resurrection Of The Daleks, including body suits, belts, jackets, helmets and the cap. The hat was re-sold (or one very similar) at another Bonhams auction in 2011. I am not 100% sure if this is the same hat - there were many made for the story so it could be one of many. 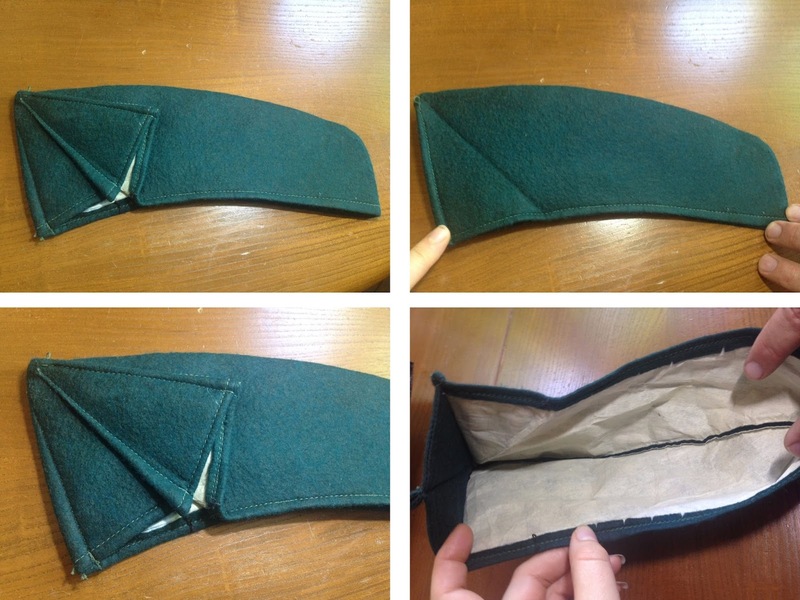 Still, the seller has provided some great detailed images of the hat, giving some clues to its construction. 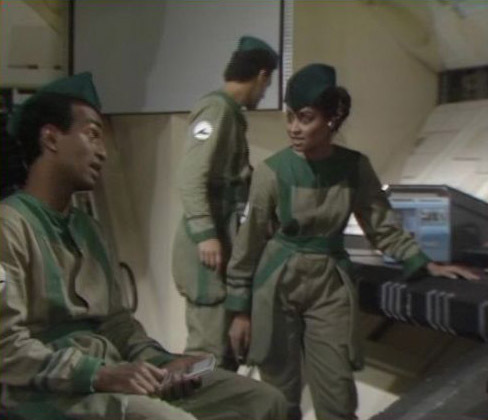 This is a genuine (not replica) cap from the classic episode of Doctor Who- Resurrection of the Daleks. It was worn by the soldiers who boarded the spaceship. 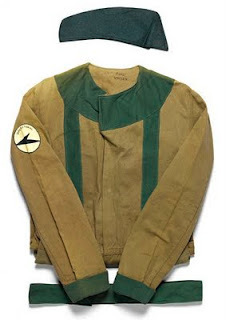 This was bought from John Fitton (RIP) Books and Magazines c. 1990, folowing the selloff of costumes from the BBC. Not sure how to price this. It originally cost me £75, and that was quite some time ago. So open to offers. Buyer is welcome to inspect in person before buying, but cash only for collection (Surrey) please. If you have any questions, please do ask. 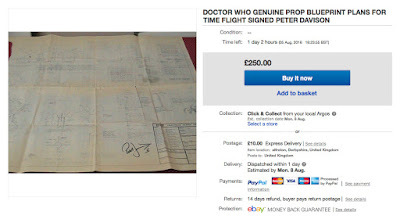 I have a number of harder-to-find Doctor Who items up for auction, so please do take a look and see if anthing takes your fancy. GENUINE BBC DR WHO BLUEPRINT PROP FOR THE PETER DAVISON STORY TIMEFLIGHT, THESE ARE THE BLUEPRINTS FOR THE MASTERS CRYSTAL BALL MACHINE, WHICH WAS A CENTRAL FEATURE OF THE STORY. THIS IS A VERY LARGE PIECE AND DIFFICULT TO PHOTOGRAPH. IN EXCELLENT CONDITION. THERE IS SOME PAPER LOSS TO THE RIGHT HAND SIDE, BUT THIS DOES NOT DETRACT FROM THE ITEM, WOULD LOOK GREAT FRAMED. 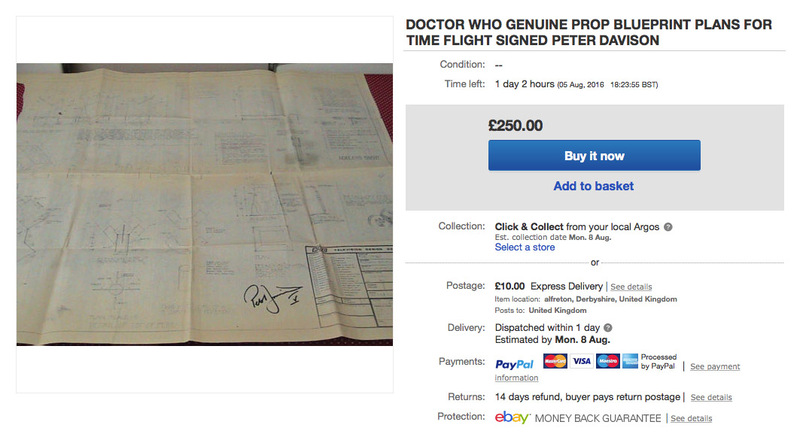 COMES COMPLETE WITH A PROP MASTERS CERTIFICATE OF AUTHENTICITY. A VERY DESIRABLE AND UNIQUE PIECE, SIGNED BY AN ORIGINAL DOCTOR. You can commission me to make a number of Fifth Doctor Costumes. Click the item titles below for more information, or e-mail me direct at tennantcoat@me.com and I can answer any questions. If you found this blog interesting, you might like to view my parallel blogs about about making my Tennant Coat and Suit. 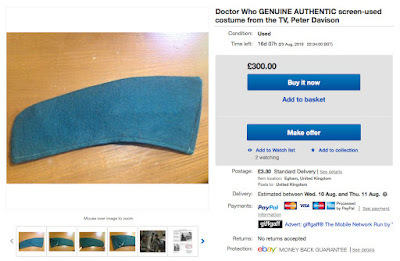 You may also like to take a look at my other blogs about making my Doctor Who costumes. 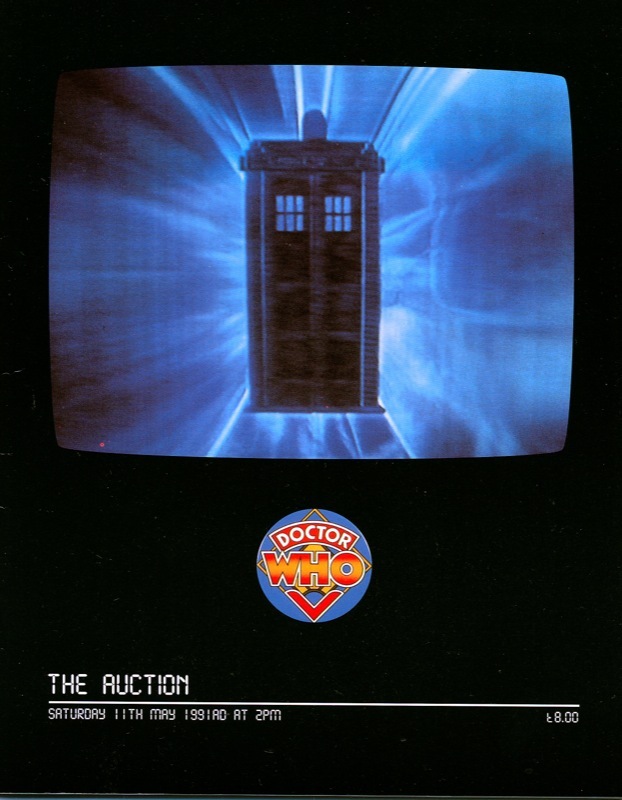 Doctor Who is copyright © by the British Broadcasting Corporation (BBC). All images on this site are copyright © the BBC or their respective owners. This site is for fun, to share ideas and not affiliated with the BBC. Five Hatband - done at last!